Many people who have mobility problems prefer to use mobility scooters instead of manual or electric wheelchairs, as they find them easier to use. This article offers advice on choosing a mobility scooter. As far as mobility scooters go, there are several different types. The most popular type is the electric scooter. Whereas the electric wheelchair are basically battery-powered wheelchairs, electric mobility scooters have three or four wheels and generally need more room to turn corners. Because of this, electric wheelchairs are better for use in the home (where space is usually more limited), but scooters often work better outside, where space is less restricted. Unlike manual and electric wheelchairs, mobility scooters are not part of the Wheelchair Scheme. This means that you will need to purchase your mobility scooter by yourself on a private basis, usually without outside help. Because of this, it pays to be knowledgeable about your options. Will you have to take your mobility scooter in the car? If so, a more compact mobility scooter is the best idea as it is easier to get in and out of the car. Can you easily get on and off the seat? Some scooters have swivel seats to make it easier to get on and off easily. It is often helpful to choose scooters with adjustable seats and backrest, so that you can alter them to suit your needs. Maintaining correct posture is especially when steering mobility scooters, particularly those that have tiller steering. Armrests can increase your comfort levels when using the mobility scooter, and they can help with getting on and off the scooter. However, not all scooters will have these. Is the supplier accredited by the British Healthcare Trades Association? Is there enough room in your home to store the mobility scooter near to a power point, so that it can be charged easily? The Motability Scheme offers financial assistance for people who are receiving the higher rate mobility component of the Disability Living Allowance (DLA). 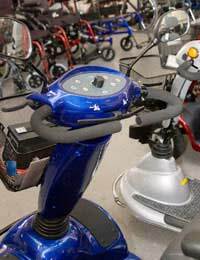 Accredited suppliers can offer mobility scooters on a hire purchase agreement of between one and three years. However, to do this you must give up all or a proportion of your regular DLA payments to Motability (who run the scheme) to pay for your mobility scooter. Many people with mobility problems who are eligible for DLA payments are understandably reluctant to part with them, as they often constitute all or most of their income and they can't do without them. If this applies to you, you can apply to a charity for financial assistance. If you can prove that you have little or no disposable income of your own, they will sometimes help you out. Your local library or Citizen's Advice Bureau will often be able to refer you to a copy of the Guide for Grants booklet that is published by the Directory of Social Change. This contains a list of contacts that may be able to help. Mobility scooters can be extremely useful for people who are suffering from mobility problems. They are often preferred over the wheelchair, but they are not always suitable for everyone. Hi I am writing this on behalf of my mum who is a pensioner and on DLA but she has no disposable income to pay for a little mobility scooter so I was wondering if you may be able to help her out with a grant please as know she is getting housebound because of the pain and difficulty if you can help that would be great thank you for reading this. She is registered disabled but how does she apply for one . Hi I am writing this on behalf of my mum who is a pensioner and on DLA but she has no disposable income to pay for a little mobility scooter so I was wondering if you may be able to help her out with a grant please as know she is getting housebound because of the pain and difficulty if you can help that would be great thank you for reading this . @Lorri. If she is registered disabled she may be able to get government help. Otherwise try some of the many "mobility" charities around or Age UK for more information.